Take the Hutchinson River Parkway South to Cross County Parkway West. Take Exit 6 for Bronx River Parkway North. Bear right onto Bronx River Parkway North. Take Exit 1 for Paxton Avenue. Make a left onto Paxton Avenue. At traffic light, make a right onto Palmer Avenue. Our office is one block down on the right side of the street. The entrance to our office is across the street from the emergency room entrance to Lawrence Hospital. Take I-287 East (toward White Plains / Connecticut). Take Exit 3 for Sprain Brook Parkway South towards New York City. After approximately 8 miles, take exit for Rte.100 / Central Park Avenue South. Once on Rte. 100 / Central Avenue, take the first exit for Palmer Road. At traffic light, make a right onto Palmer Road. Palmer Road becomes Palmer Avenue once you enter Bronxville. Take I-87 (Major Deegan Expressway) North. Take Exit 5 to merge onto Central Park Avenue / Rte. 100 North. Proceed north on Central Avenue / Rte. 100 to the ramp for Palmer Road East. Make a right onto Palmer Road. We suggest you do not park on Palmer Avenue as the meters there have a 30 minute time limit. If you proceed to the stop sign at the round-a-bout, make a right onto Parkway Road, you will find 1-hour meters there, or 2-hour meters just a block further down that road. Bronxville is serviced by the Metro North Railroad. Take the Harlem Line, also known as the Blue Line. There are both local and express trains that service Bronxville. Our office is located directly across the street from the train station. Click here to check the daily train schedules. Use the Bee-Line System, Bus #30. 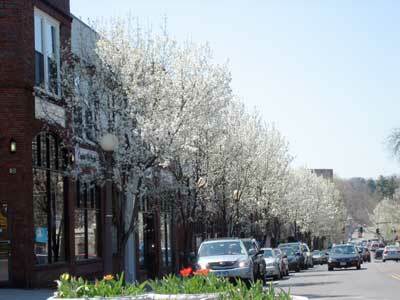 The bus stop is adjacent to the Bronxville train station, directly across the street from our office. Click here for the Bee-Line System bus schedule (choose #30 for the bus to Bronxville).